Braunfels’ String Quintet was composed in 1947 but is heard here in the orchestration for string orchestra made by one of his students, Frithjof Haas. Some early reviewers found the quintet ‘orchestral’ in scope so perhaps the expansion is not altogether surprising. This fluid, fluent 40-minute work generates a palpable but quiet sense of melancholy through its introversion and elements of chromaticism, its Tristanesque echoes, not least in the slow movement further clarified by moments of animation. Braunfels ensures that the lines are not saturated, something that Haas reinforces in this string orchestra version where the vitality of the scherzo acts as a counter-balance to the veiled loss of the opening two movements. It’s in the finale when Barunfels, having passed through the narrative of loss in the earlier part of the work, feels able to embrace the lighter side of things. Thus, themes are vivacious here, and there are strong hints of folkloric influences in this unbuttoned context, the music relaxing to embrace rich developmental passages, romance and even possibly Hungarian-influenced elements. One of his next works was the Sinfonia Concertante, for violin, viola, two horns and string orchestra, composed during 1947-48 and premiered in Hamburg in 1949. Though it lasts only half an hour it’s notable for its unhurried sense of time. This feeling is conveyed through its rhythmic shifts and patterns and its promotion of strong moments of stasis, especially in the first of its four movements. There is a fairly standard moment of contrast in the fleet scherzo, where the music slows absorbingly, and the Adagio is quietly, undemonstratively expressive. 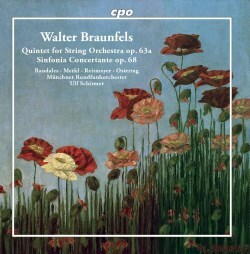 Braunfels’ orchestration is always deft, invariably apposite and he balances the two string instruments – the two favoured by Mozart in K364 – and the two horns well, but he doesn’t promote any sense of virtuoso give-and-take, nor any particular echo effects or repeated patterns. The music remains conciliatory and fraternal. The Baroque and Romantic elements of the finale find the four soloists at their most extrovert, the horns at their most glistening and the strings at their most scurrying. The extensive notes don’t skirt the dangers of over-written tendentiousness, if the English translation is an accurate flavour of the German original, but sink straight into it with predictable results. The recording, thankfully, is good, and the performances equally so under the experienced direction of Ulf Schirmer, which is valuable as neither work gifts its subtle secrets easily.